Freshservice is a winner of our Supreme Software Award for 2018 as well as our Best Customer Service Software Award for 2018. It is a very popular cloud-based customer support platform that was founded with the mission of enabling companies of all sizes to provide great customer service. It provides plug and play ITIL that complies with best practices without the need for expensive consultations or expert opinions. Its key functionalities include a robust ticketing system, accessible knowledge base, asset discovery, and CMDB. Moreover, the software is equipped with capabilities, such as, vendor management, incident management, problem management, change management and release management. How exactly will Freshservice enhance the quality of your service? The core module of the system is Incident management, developed in a way which lets no customer query fall through the cracks. With a service desk accessible through several channels, you can automate all routine and mundane tasks, and let your team collaborate in order to find the best solution for each query. Freshservice will also do a great job analyzing and resolving problems before they’ve had whatever impact on your business’s productivity, as it ties sudden incidents to common problems, examines the root cause and suggests valuable workarounds, and keeps all issues recorded in a known-error database until you’ve come up with a permanent solution. Another competitive edge of this easy-to-use system is planning, tracking, and rollback of changes, the lack of which is known to cause approximately 80% of all IT issues. With Freshservice in your toolkit, you will have modifications and resources properly tracked, and thus be able to analyze the risk and potential impact for each of them. This is how you get to prepare your own rollback plan for unforeseen and unexpected changes, and send CAB approval requests from the very same platform. Last, but not least, Freshservice is cloud-hosted, and requires literally zero maintenance while keeping data secure and the system fully automated. Its flexible pricing plans are scalable to its clients’ growth and needs, with a free plan (Sprout) included to cater to teams with up to 3 agents. A detailed review of Freshservice prepared by our experts is also available with a thorough analysis of Freshservice capabilities and features. This service desk software is cloud-based, it is easy to install, requires low maintenance and effectively runs on autopilot. Customers can log in from any device, anywhere, and deliver exceptional IT service to their users, 24/7. Freshservice has flexible pricing plans that are scalable, or adjusts to the size of the business, depending on what the user needs. Its plug and play ITIL complies with best practices and does not need an expert opinion or consultation. The CMDB keeps all configuration items, change logs and relationships in one place. Freshservice ticketing system is fully customizable with field templates. It is also equipped with smart notifications, service levels and escalations, proactive alerts. Freshservice ships with a self-service portal that lets end users raise tickets, check status of older tickets, get notifications, request new services and browse knowledge base articles. A handy feature suggests accurate articles contextually from the knowledge base even as the end user is trying to raise a ticket thus letting the user solve his or her issues on their own. Freshservice’s service catalog is designed to look and work like a modern eCommerce portal. This makes it easier for end users to request new services. The service catalog is powered by a powerful and flexible backend letting IT teams add/remove/edit service items easily. Freshservice’s mobile app lets IT teams work even when on the move. This has enabled teams to resolve IT issues with great speed and focus on customer happiness by communicating with the customer effectively. Freshservice’s mobile app also lets end users raise IT issues and service requests on the go. This has played a crucial role in adoption. What Problems Will Freshservice Solve? Companies usually face a problem in end user adoption of ITSM solutions. The end users would rather walk up to the IT team and inform them of their issues or even email them issues. And most of these issues emailed are usually ones that are either solved easily or existing issues. IT spends a lot of their time focusing on such issues, thus not being able to focus on the more crucial and important issues. 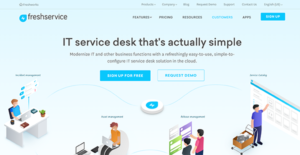 Freshservice has helped companies solve this adoption issue by making an intuitive and user-friendly interface that end users and even IT teams love to use. As more and more companies are moving to the cloud, one major problem IT teams face is in managing the enterprise cloud. Freshservice lets IT teams manage the cloud easily through its built-in CMDB. Freshservice is a product from Freshdesk, which is a preferred partner to Amazon Web Services, the preferred cloud infrastructure company for most cloud companies. Each enterprise has different requirements and requires a system that can be customized for their size, kind of staff members and buyers, and the particular industry they are in. For these reasons, no platform can proffer perfect tools off-the-shelf. When you look for a software product, first be sure what you want it for. Read some Freshservice reviews and ask yourself do you desire basic functionality or do you require advanced features? Are there any industry-specific features that you are seeking? Obtain the answers to these questions to aid your search. There are multiple elements that you need to consider and these include your finances, specific business requirements, your organization size, integration needs etc. Take your time, use a few free trials, and finally zero in on the platform that offers all that you require to enhance your company competence and productivity. How Much Does Freshservice Cost? We realize that when you make a decision to buy IT Service Management Software it’s important not only to see how experts evaluate it in their reviews, but also to find out if the real people and companies that buy it are actually satisfied with the product. That’s why we’ve created our behavior-based Customer Satisfaction Algorithm™ that gathers customer reviews, comments and Freshservice reviews across a wide range of social media sites. The data is then presented in an easy to digest form showing how many people had positive and negative experience with Freshservice. With that information at hand you should be equipped to make an informed buying decision that you won’t regret. What are Freshservice pricing details? What integrations are available for Freshservice? Pros: If there is something to regret about Freshservice, it is that I didn’t find out about it sooner. It took me a while to replace the system we had, meaning I checked every package, and ‘sieved’ between all kinds of suppliers to estimate both the service and the support. As you can guess, the experience was painful, and I didn’t really work out enthusiasm for any of them. All of that before Freshservice appeared! Being able to compare functionality, flexibility, customization, and administration, I bet my bottom dollars that Freshservice is the best product on the market. The price is ridiculously low compared to its operation, which is probably one of the main reasons for the product to be so popular. Cons: No need to create a fuss about it, but the reporting portfolio is quite inflexible. However, I overheard they’re a stone throw from developing a new one, and I am only hoping it will happen soon. Pros: False modesty aside, we’ve mastered functionality in end-user support. We took full advantage of Freshservice’s features to perform detailed tracking, and to make accurate reports for our proactive response. Both we and our customers are extremely satisfied with it. Cons: It’s not such a big deal, but both semantics and lexis could be improved. I don’t always dare to configure my settings, because I can’t understand the effect my action could provoke. These errors spoil the full picture, and I’m sure there is much to be reconsidered in the future. Looking for great quality? You found it! If you need more information about Freshservice or you simply have a question let us know what you need and we’ll forward your request directly to the vendor.